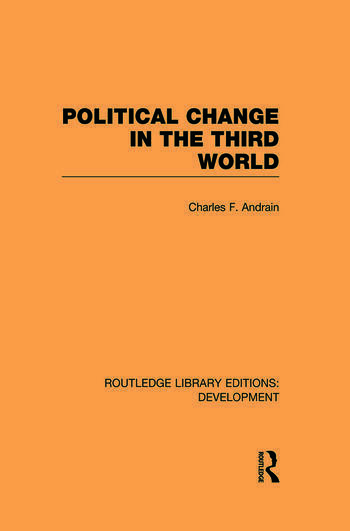 In this informative and highly readable book, first published in 1988, Charles Andrain explores the ways in which public policies and socio-political beliefs and structures cause political change in the Third World. The author examines 3 types of political change: (1) transitions in political leaders and their policies, (2) fundamental transformations in political structures, policy priorities, and political strategies for dealing with policy issues; and (3) the impact of economic, education, and health care policies on the society itself (including changes in unemployment, inflation, economic growth, literacy and birth and death rates). In the first part of the book, Professor Andrain presents a general overview of political change in the Third World, explaining how different models of political systems explain the dynamics of political events in Latin America, Asia, Africa and the Middle East. In the second part of the book, he then applies these models to specific changes in five developing nations: Vietnam, Cuba, Chile, Nigeria and Iran. The book is unique in its careful blending of a policy focus with a structural analysis of nation states, domestic social groups, and international institutions in the often turbulent regions of the developing world. It thus provides a very useful systematic approach to political developments in the Third World that will be welcomed by students, faculty and general readers.